Lake Arrowhead Lake Front Homes. The Lake Arrowhead Lake Front market is alive and well in Lake Arrowhead, CA. I have taken and broken down a year by year look at 2011 and 2012. 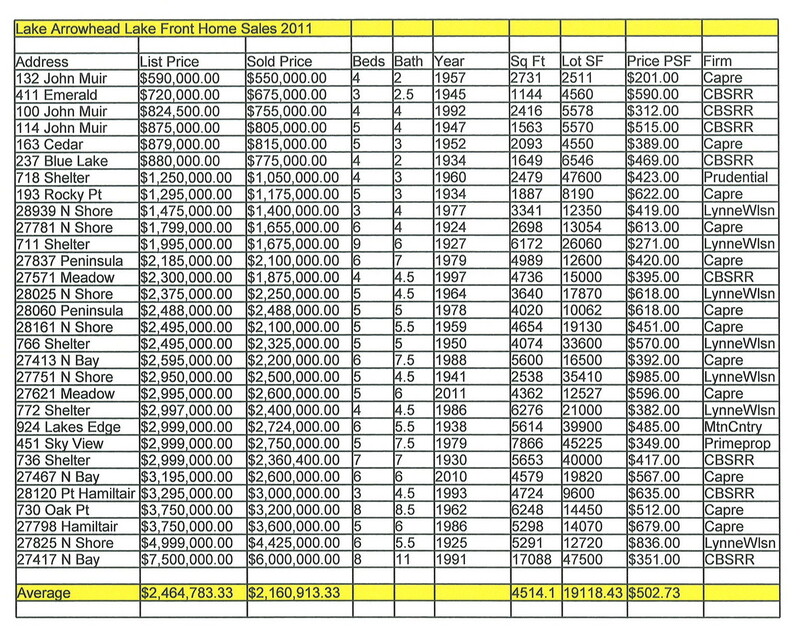 We had 30 Lake Front homes in Lake Arrowhead sell in 2011 verses in 2012 we had 24 Lake Front homes in Lake Arrowhead sell. This can be equated to a change in our inventory from two years ago which gives us a lower inventory now. In 2012 we had a few really good deals out there on Lake Front Homes in Lake Arrowhead, a couple were short sales and bank owned properties… and those were fantastic deals and money in the bank for the buyers! I am sure there will be other great deals out there and there are some great deals out there currently for Lake Front Homes in Lake Arrowhead. If you are a buyer in the market for a Lake Front Property in Lake Arrowhead call me, Kim Sellers (909)725-1248, I will give it to you straight what is on the market and what areas might fit your personal needs. Are you looking for a level entry, bigger lot size, deep bay, close to the Lake Arrowhead Village, Lake Arrowhead Yacht Club, etc… These are questions that I can answer for you. 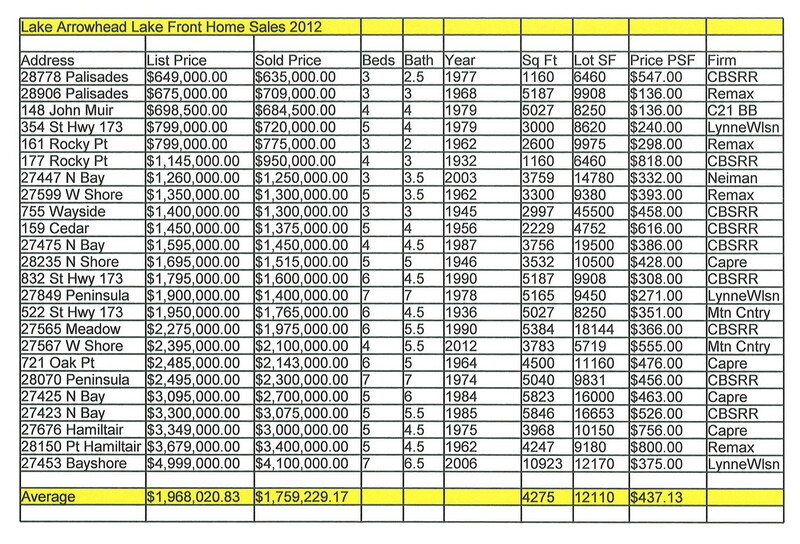 Pricing will be affected depending on those needs and the different lake front communities surrounding Lake Arrowhead. The following charts show home pricing in 2011 and 2012. All information was obtained from RIMAOR and is deemed reliable but not guaranteed.